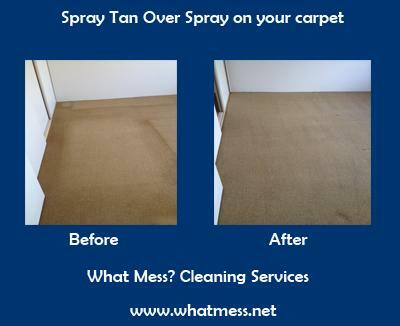 Can Spray Tan over spray be removed from your Carpets? Today we got called to a property to clean the carpets as they were vacating. When we carried out our Carpet Pre Inspection the customer explained how her daughter loves Spray Tanning, as you can see in the photo, when all the furniture was removed that the carpet was covered in over spray, and you could see the outline of the furniture. I had never come across this before, so I was uncertain if I could get it out. To my surprise (as you can see in the after photo) we managed to remove it all and the carpet looked brand new again.